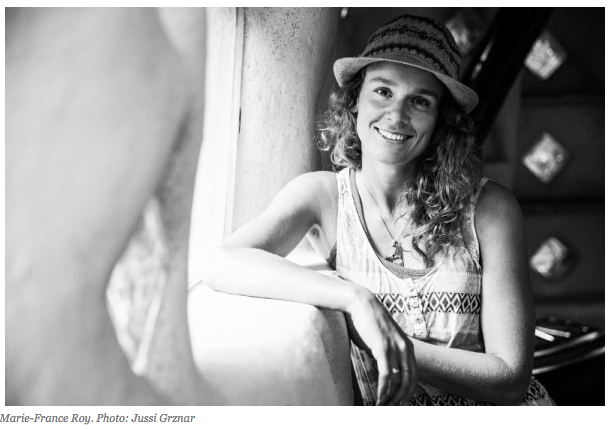 CARLSBAD, Calif., Jan. 29, 2015 — New for 2015, TransWorld SNOWboarding, in partnership with Protect Our Winters, will present the Climate Activist Award to Marie-France Roy at the 16th Annual Riders’ Poll Awards. With the National Oceanic and Atmospheric Administration (NOAA) and NASA recently announcing that 2014 was the hottest year across global land and ocean surfaces, the creation of this new award is especially timely, as this is the first year since 1990 that the high temperature record was broken in the absence of El Niño conditions in the central and eastern Pacific Ocean near the equator. The 10 warmest years on record have also all occurred since 2000. To select candidates for the award, TransWorld SNOWboarding and Protect Our Winters looked for riders who inspired others, took meaningful action, and did something notable in the past year in the fight against climate change. After careful consideration of several riders who embodied this spirit, Marie-France Roy was chosen for her bold move to step away from filming a traditional video part to make The Little Things movie. The film includes some riding but focuses mostly on Roy’s own efforts to reduce her environmental footprint and highlights other riders taking action on the grassroots and political levels, including Jeremy Jones, Gretchen Bleiler, and Tamo Campos. While it’s difficult to have zero carbon footprint, Roy has consistently looked for ways to reduce her impact in her daily life, making her an example to snowboarders everywhere, another reason she was chosen for this award. Join us on Friday, January 30 at the Ogden Theater in Denver, Colorado to recognize Marie-France Roy for breaking the mold and standing up for what she believes in. Doors open at 7:00 p.m. The show starts at 8:30 p.m. For those who can’t make it, catch videos of the winners at TWSNOW.com/riderspoll. The Riders’ Poll Awards are sponsored by GoPro, Martin Guitar, Bird Dog Whiskey, and Pabst Blue Ribbon. For updates, get connected to our Facebook, Twitter and Instagram feeds at @TWSNOW (#RIDERSPOLL16). TransWorld SNOWboarding is the world’s number one snowboard media outlet with an audience of over 1.4-million. Celebrating 28 years since its inception in 1987, TransWorld SNOWboarding continues to successfully and creatively cover the snowboard culture with innovative photography, original videos, award-winning print and multi-layered digital magazines, snowboard instruction, consumer events and cutting edge awards shows. TransWorld SNOWboarding can be found online at TWSNOW.com and is based in Carlsbad, California.